"The snow glows white on the mountain tonight. Not a footprint to be seen. A kingdom of isolation, and it looks like I'm the Queen." Does this song ring a bell to you? I definitely know every word of it because this is my girls' favourite song. In fact, we like to sing together as a trio, just 'let it go' and sing to our hearts' content. It's been almost two years since the release of Disney's Frozen but for many little girls, the Frozen fever has yet to subside and it seems like it will be here to stay for a long, long time. To delight my two Frozen fans, we've done Frozen themed parties, DIY birthday invitations and made our own Frozen jewellery. While the girls love to dress up in their Elsa dresses, most of them are a little over the top with elaborate details, making them unsuitable for our hot and humid weather. Thus, they are only worn on special occasions like when we attend birthday parties or functions. 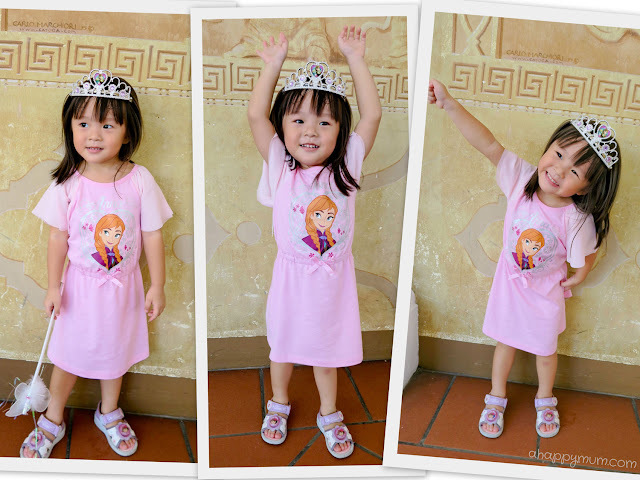 If only, if only there could be Frozen themed dresses that were a tad more casual yet princessy enough to make the girls happy! Thanks to the newly launched Frozen Bloom collection by Bossini, a joint collaboration with Disney, my princesses are thrilled to be wearing these Elsa and Anna inspired outfits and can't wait to show you more of what they picked for themselves! 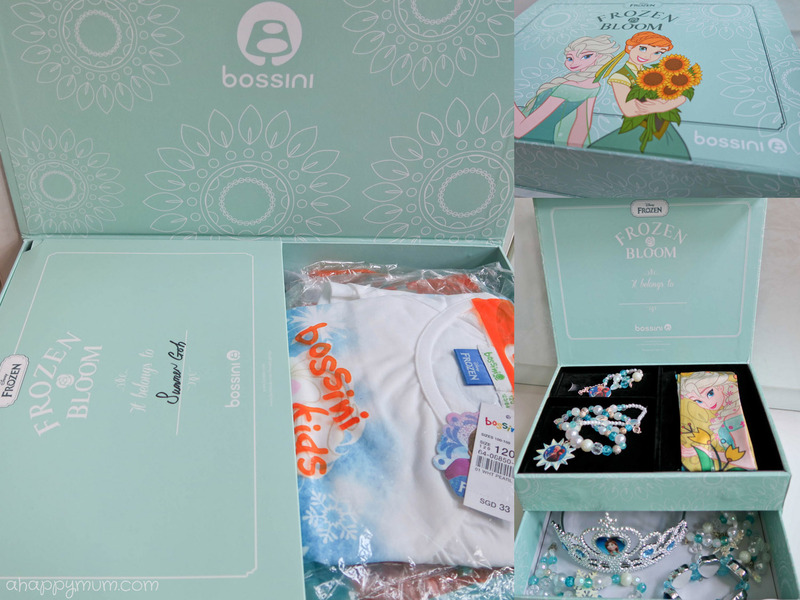 This season, Bossini joins hands with Disney to infuse the tropical summer with the cool bloom of Frozen characters. Drawing inspiration from the styles of Elsa and Anna, this collection is designed in the “ice blue” and “snowy scene” themes with brand new spring elements of sunflowers and emerald green touches. One of the most appealing factors about the collection is how vibrant and cheerful the outfits look. 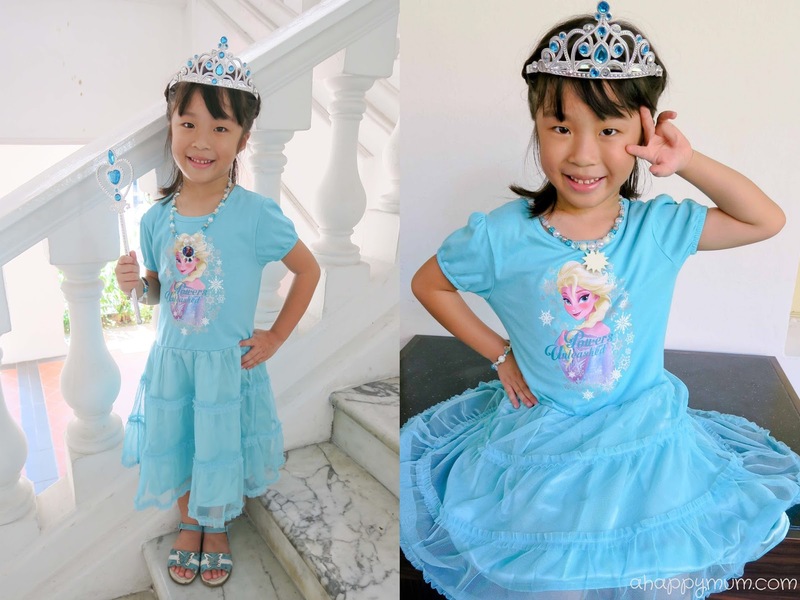 Angel is wearing the Elsa Print Mesh Dress and while the top part is casual and comfortable enough for everyday wear, the bottom jazzes up the dress and gives it a princess-like charm. Ariel is wearing the Anna Print Dress in Baby Pink which is the one she loves most when we went through the entire collection. The dress design is simple, straightforward and the cute lotus-leaf sleeves make it more stylish for the little ones. So the big sister is dressed in an Elsa dress while the little sister in an Anna dress, how apt, right? I really hope they can be not just sisters, but best friends for life too. With their tiaras, wands and handmade Frozen jewellery (tutorial here), the girls really felt like princesses and the best thing was they did not perspire much and could still run and jump around at ease! Then there are also days when both of them want to be Queen Elsa just because "she is cool and has powers". I always assumed that Frozen outfits has to go with snow and all things icy blue but after seeing the Frozen Bloom collection, I realised that flowers can be a good match too! 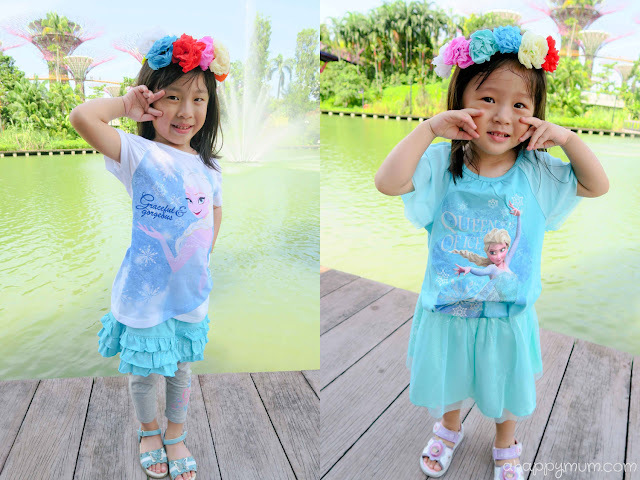 Angel has on the Elsa Print Tunic in White matched with the Skirt Legging in Angel Blue. I like the puffed-sleeve and asymmetrical design of the tunic which makes it look trendy. As for leggings, I've always wanted her to wear them as she is very active and likes to move around. However, she usually prefers something more girly. Doesn't this pair of skirt leggings, with cute ruffled layers in the sweet blue skirt, suit her to a tee? As for Ariel, she has on the Elsa Print Tunic in Angel Blue and the Mesh Skirt in Angel Blue. The skirt has a lovely snowflake print and the sparkly glitter on the mesh makes it a perfect match for an Elsa top. 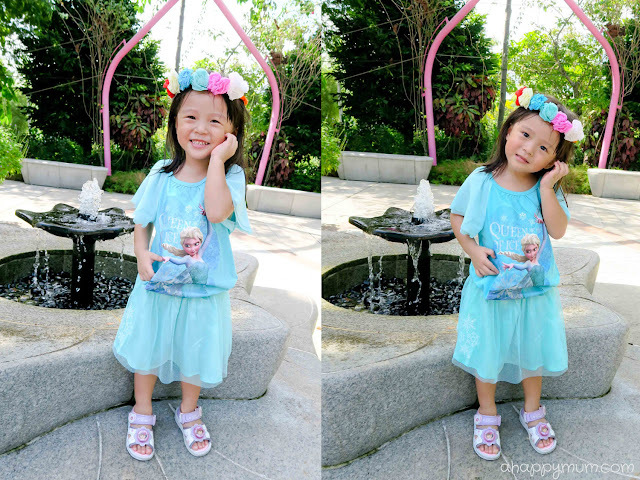 The girls are also wearing our DIY rainbow flower crowns (tutorial here) since we were going to visit Gardens by the Bay. See, Frozen and blooms can go together quite well, right? Judging from the smiles and happy faces, I guess it wasn't hard to tell that the girls were really in love in their new outfits. Casual yet comfortable and chic - definitely the kind of apparel that we go for. We were also excited to receive a beautiful mint green box containing all the apparel and even an exquisite jewellery box to store all our Frozen accessories. I wish that this could be made available to the public but a check with Bossini revealed that this was purely meant as a media kit. So yes, lucky us! For those who have boys, especially those who are fans of Kristoff, Olaf, Marshmallow or Prince Hans, you'll be thrilled to know that there is a handful of cool printed tees and shorts available in the Frozen Bloom collection too! To view all the designs, go here. It's time to Let it Bloom! Do visit your nearest Bossini outlet and pick out your favourite outfit for your child from the Frozen Bloom collection today (available at all Bossini stores except for Bedok Central). I hope you'll like it as much as we do! For more information on the Frozen Bloom collection, visit www.bossinibehappy.sg or Bossini's Facebook page.